If schools desire well behaved and motivated students, involved parents and community support, these constituents must perceive the curricula options as appropriate. There is no one curriculum that is right for every student. The varied abilities, interests and goals of students require more than a single curriculum. Examination of traditional, public-school curricula show that they emphasize preparation for college. Elementary school curricula prepare students for the secondary curriculum, which then prepares students for higher education. Some school systems claim to offer alternative curricula, a few actually do, but the college preparatory curriculum prevails. Further, legislators and others concerned with public education want to strengthen the traditional curriculum. Increasing the requirements in the traditional curriculum may be proper for students with college as their goal. However, such efforts can make the curriculum less flexible and less relevant for students who do not intend to go to college. This latter group accounts for most of the students in the public schools. In the U.S., estimates suggest that about 25% of the students who enter school will drop-out before graduation. Drop-outs are students who vote with their feet. They choose to get out of an environment that they perceive as negative. Of the remaining 75% who finish high school, about 50% go on to college. Of those that go to college, about 50% graduate. Thus, a college preparatory curriculum only meets the needs of about 20% of the public school population. Some will argue that the proportion of students entering and completing college should be higher. They might say public schools aren’t doing their job and academic requirements for high school graduation aren’t rigorous enough. Unfortunately, the only way there can be a significant increase in college attendance is to lower the curricula standards in colleges. Only students who, intellectually speaking, are bright-normal or above can benefit from a college education. Given a normal distribution of intellectual ability, only about one-quarter of the population is college material. Further, not all students with the ability want a college education. Thus, there probably isn’t much room for improvement in the proportion of the population graduating from college. Completing high school or even some college often does not prepare one to make a positive contribution to the adult community. The rate of unemployment for young adults is several times higher than the rate for the general adult population. This would not be the case if most young adults entered the work force with a proper education. Leaders in business, industry and public agencies all lament the level of functional skills in young people seeking employment. Students need functional skills in reading, writing, and mathematics. Skills for problem solving, and independent learning are needed too. There are many life skills such as parenting skills, that are deficit in our youth. Work skills such as taking directions and cooperation that are critical to success are lacking. Finally, there are the skills needed for employment in specific occupations. All of these needs can and should be met by public school programs. What is a proper curriculum? The curricula options available in public schools are important for students, their parents, and the community. There is wide variation in the needs and goals of these constituencies and within each of them. Therefore, no single curriculum is likely to be proper for every student. Only diverse curricula will meet the wide ranging needs and goals of public school students. Consumers must have input into what curricula will meet their diverse needs. Decisions about curricula matters should not be left solely to professional educators. Students, parents and representatives of the community need to participate in the decision process. An outline of a diverse public school curriculum follows. It is not a proposal but an example. It is simply a stimulus for thought about what a diverse curriculum might look like. The curriculum example has three levels: Readiness, basic literacy and advanced options. The curriculum is uniform at the first and second levels. It becomes more diverse at the third level. It rests on several assumptions. 1. The delivery model used will promote flexibility in the choice of teaching materials and methods. Such a model will make it possible to adapt to different learning styles and rates. 2. The curriculum represents a continuum. Placement in and movement through the curriculum depends on the mastery of objectives. 3. The curriculum will be open and movement between options available any time a student chooses. The offerings at the upper level are not age restricted. That is, older individuals wishing to return to school and pursue a different option can do so at any time. 4. The curriculum is appropriate for most students, including those with mild disabilities and learning problems. Special adaptations and modifications would be necessary for students with moderate to severe learning problems. 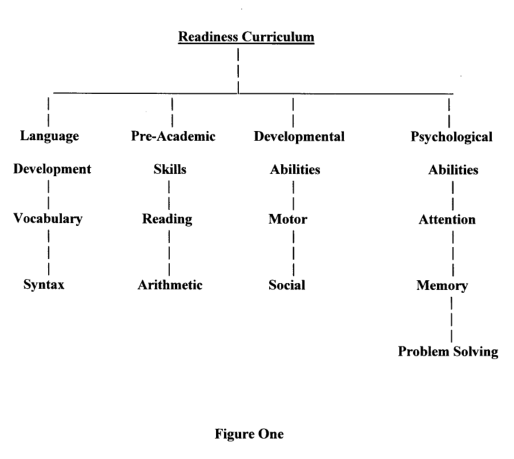 The readiness curriculum (see Figure 1) would serve children during the early childhood period. It lays the foundation for basic literacy. There are four strands in this curriculum. First, the language strand would focus on developing language skills including both vocabulary and syntax. It would emphasize interpersonal, language stimulation activities. Second, the developmental abilities strand would focus on gross and fine motor skills and social skills. It would employ stimulating activities involving movement and peer interaction. Third, the psychological abilities strand would focus on various prerequisites for efficient learning. It would work on abilities like visual and auditory attending and memory and problem solving skills. Fourth, the pre-academic strand would lay the foundation skills for reading and math instruction. It would teach skills such as letter and number discrimination, letter sound relationships and number and quantity relationships. Mastery of the readiness curriculum would be the prerequisite for moving on to the basic literacy curriculum. 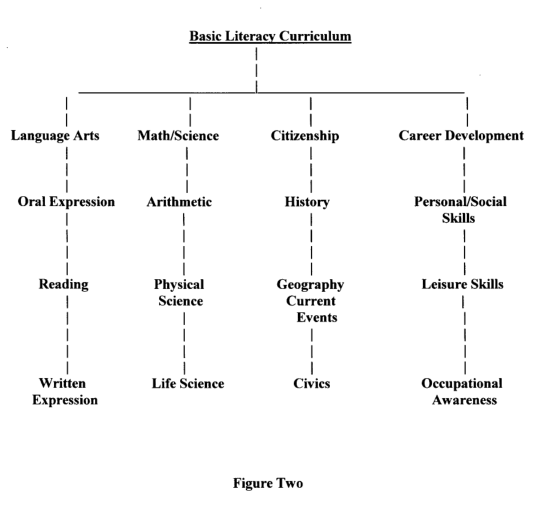 The basic literacy curriculum (see Figure 2) would serve children during the middle childhood period. It would provide basic literacy skills at a functional level. That is, the essential skills generally needed to function in the everyday world. Delivery of this curriculum would be through classroom instruction with extensive use of both simulated and real-life application experiences. In short, instruction would focus on developing functional academic skills. This curriculum would also have four strands. First, the language arts strand. This strand would have three sub-components: Oral expression, reading and written expression. Second, the math and science strand. This strand would have three sub-components: Arithmetic, physical sciences and biological sciences. Third, the citizenship strand. This strand would also have three sub-components: U.S. history, civics and current events including geography. Fourth, the career development strand. This strand would have three sub-components: Social skills for daily living, occupational awareness and leisure skills. Minimal competency in this curriculum would be a prerequisite to move on to the advanced curriculum options. Minimal competency would be at about third to fourth grade level in traditional terms. Mastery would be competency at about fifth to sixth grade level in traditional terms. The advanced options curriculum (see Figure 3) would serve students in late childhood, adolescence and occasionally adults. The curriculum would have two major strands: College preparatory and vocational. Entry into the college preparatory curriculum would require mastery of the basic literacy curriculum. Entry into the vocational curriculum would depend upon the strand entered. Entry into the technical and business strands would require mastery of the basic literacy curriculum. Entry into the arts, trades and service strands would require minimal competency in the basic literacy curriculum. The college preparatory curriculum would have three sub-components. The arts sub-component would be for students interested in pursuing higher education programs in such fields as art, music, literature, history or religious studies. The science sub-component would be for those interested in pursuing higher education programs in such fields as biology, physics, computer science or mathematics. The professional sub-component would be for those interested in pursuing higher education in fields such as education, medicine, law, business or engineering. This curriculum would have two parts. The introductory phase would emphasize advanced instruction in a broad range of academic disciplines. Advanced instruction would concentrate on the core curriculum in higher education programs. In addition, there would be career development activities for daily living skills, social skills for employment and career exploration. The specialization phase would emphasize advanced study in the disciplines related to a student’s specific career goal. This would also include career internships in appropriate settings. The vocational curriculum would have two parts. In the first phase, the students would focus on career specific development of applied academic subjects. This would include career development programs that address daily living skills, social skills for employment and career exploration. In the specialization phase, the emphasis would be on vocational preparation and supervised work experiences. 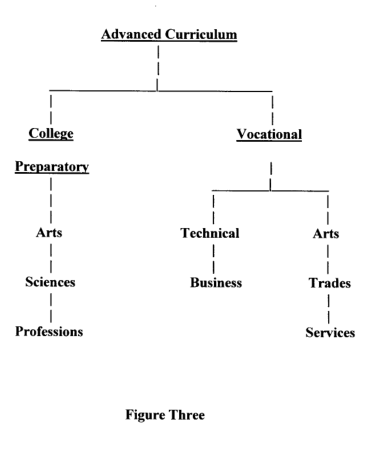 The vocational curriculum would have five strands. Entry into strands one and two would require mastery of the basic literacy curriculum. Entry into strands three through five would require meeting minimal competency in the literacy curriculum. The first strand would be the technical strand. This strand would be for those individuals who desire careers in technical fields. Technical careers would include laboratory technician, electronic repair and maintenance work, and communications media. The second strand would be the business strand. This strand would be for individuals interested in careers in fields such as office management, commercial sales and secretarial services. The third strand would be the arts strand. This strand would be for those pursuing applied careers in commercial art, graphics, and entertainment. The fourth strand would be the trades strand. This strand would be for individuals seeking careers in areas such as construction trades, home appliance repair and equipment operation. The fifth strand would be the services strand. This strand would be for those interested in careers in service occupations such as retail sales, personal grooming and child care. The school environment should be a comfortable setting. There should be adequate provision made for a comfortable level of space. Every classroom should have adequate space for the students and the class activities. Adequate space certainly means providing ample room for seating. It also means providing room for specialized functions such as small group work, learning centers, and individualized programming. Space requirements include storage space for each student and for the storage of instructional materials and records. Teachers also need suitable space for non-teaching duties such as planning, conferences and record keeping. In addition, teachers need an area where they can get away from the classroom to take a break. Finally, there must be suitable space for functions such as eating, recreation, discipline, administration and toileting. Furthermore, the physical facility must have good lighting, ventilation, heating and cooling. Safety begins with a well maintained physical facility that is adequate for its purpose. In addition, safety depends on having a good discipline policy and following it. Many of the points discussed earlier concerning discipline policy and support programs impact directly on the issue of safety. Safety is an issue throughout the school and not just in classrooms. Safety is also important in bathrooms, the lunchroom, recreational areas, and hallways. Safety concerns include the school grounds and transportation services for students as well. Discipline policy and support programs must satisfactorily address all of these areas of concern. A positive school climate is much more likely when parents are supportive of the school and involved in its program. Educators frequently complain about the lack of parent interest and involvement in schools. There are at least two reasons parents fail to become involved. First, if parents’ perception of the school climate is negative, they will probably be either passive or active resisters. Second, parents seldom feel that they have any constructive avenues for influence available. Traditionally, the only role for parents has been as a member of a PTA or PTO or as a volunteer worker. Parent organizations seldom amount to more than cheer leading squads. These organizations do not provide an opportunity for meaningful input into the educational program. With two-income families being the norm today, few parents have the time for activities that don’t make constructive use of their limited time. Since parents and children are the consumers of our educational programs, they need to have a significant role in the program. Parents need to have a voice in decision making. Every school should have a democratic parent organization that has a voice in the management of the school through an elected advisory committee. The advisory committee should represent the majority and dissenting views of parents on a wide range of matters, including discipline policy, curriculum, and program evaluation. A parent organization should serve as a vehicle for parent- initiated changes. It should also provide a forum for criticism of existing policies and programs. In addition, there should be an advisory committee that represents parents on a system level. A system-wide committee might include the chairperson for each of the school-level committees. The system-wide committee should represent the views of parents to the superintendent and school board. Educators must provide for this type of input and incorporate it into the decision-making process. If parents have a mechanism for constructive participation, their interest and involvement in the schools will improve. Apathy is, in large part, a product of feeling powerless. Create a process that values parents and makes them feel effective and apathy will decline. Real participation by parents requires that educators recognize the need to share their professional power with the consumer. If educators want parent involvement, they must not be defensive but open and inclusive. Parent participation in education will increase support for public schools and lead to improvements in the schools and their programs. A quality educational program not only needs the involvement of educators, parents and students but also the community. Community resources are very important for the support programs discussed earlier. The community is also a consumer of public education and needs representation in the decision making process. Representative members of the community should sit on school advisory committees along with parents. There are many constituents in the community that need an opportunity for input into public education. These include local businesses and employers, public service agencies and organizations, colleges and universities and vocational and technical schools.